In Golf, India's Gaganjeet Bhullar today grabbed his maiden European Tour title. 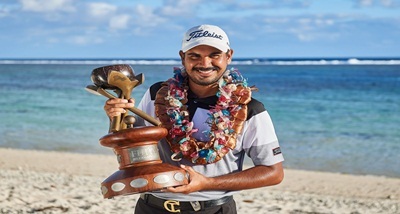 At the Fiji International in Natadola Bay, Bhullar soared high with a brilliant chip-in eagle on the 17th hole for a one-stroke win over a charging Anthony Quayle of Australia. It was Bhullar's first win on the European Tour, ninth Asian Tour title and 10th crown overall. He now becomes the most successful Indian player on Asian Tour, overtaking the tally of eight tour wins by Arjun Atwal and Jyoti Randhawa.